This article first appeared in The Edge Malaysia Weekly, on December 17, 2018 - December 23, 2018. Inari Amertron Bhd is a good proxy for the exponential growth of semiconductor industry, given its strategic positioning on the value chain. The group’s involvement in radio frequency testing allows it to ride the demand for components in the telecommunications sector. The rising popularity of smart devices such as smartphones and tablets has consistently fuelled the group’s revenue growth over the years. 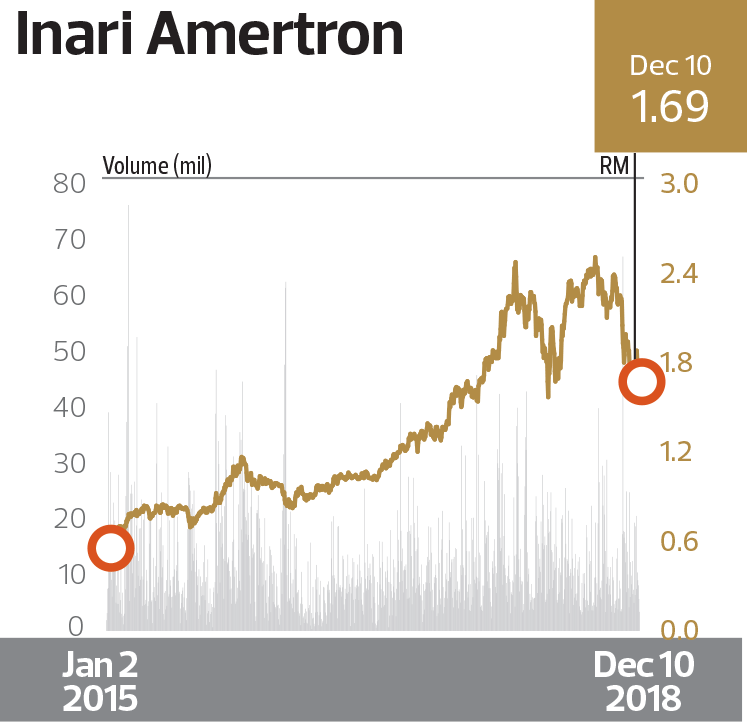 Its steady earnings growth has generated a impressive return on equity in the past three financial years, enabling Inari to walk away with The Edge-Billion Ringgit Club’s Highest ROE award in the semiconductor sector. Inari’s ROE was over 38% in the financial year ended June 30, 2014 (FY2014) but that eased to 28% in FY2015 as its shareholders’ equity doubled from RM258.2 million in FY2014 to RM537 million in FY2015. By F2017, shareholders’ equity was RM875.5 million but ROE increased to 26% in FY2017 from 22% in FY2016. Based on the The Edge-BRC awards criteria, Inari’s adjusted weighted ROE over three years was just under 30% — far above peers in the technology sector. In FY2016, Inari saw a slight decline in its net profit to RM148.25 million, compared with RM152.54 million in FY2015. However, in the following year, Inari saw a 54% year-on-year jump in net profit to RM227.76 million in FY2017. The sustainable earnings growth over the years has attracted investor interest. Inari’s share price has been on an upward trend between June 30, 2015 and June 30, 2018. Based on the adjusted share price, Inari surged 186% from 78.3 sen to RM2.24 during the three-year period. With a stellar earnings performance, the group has not neglected to reward its shareholders. Inari declared a dividend per share of 8.9 sen in FY2015, 8.4 sen in FY2016, and 9.8 sen in FY2017, bringing the total to 27.1 sen for the three financial years. Besides regular dividends, Inari has undertaken two bonus issues — a one-for-one issue in January last year and another one-for-two issue in March this year. Inari is principally an outsourced semi­conductor assembly and test service provider, with major undertakings including wafer processing, chip fabrication and wafer certification in fibre-optic chips, advanced systems in package assembly and other services such as sensor and IC package design. It operates 12 plants in Malaysia, the Philippines and China, with more than one million sq ft of floor space and more than 6,000 employees. Inari’s share price has retreated from its peak of RM2.507 in August this year, after making a significant jump in the past three years. Still, analysts see upside potential in the stock. It remains on the recommendation lists of many analysts and according to Bloomberg, 12 out of 17 analysts who track the company have a “buy” call. AmInvestment Bank analyst Tan Kai Bin is upbeat on Inari’s prospects as the radio frequency segment is seen as a beneficiary of the transition to 5G and rising content per device, while the laser devices segment stands to benefit from the increasing biometric and augmented reality applications in smartphones. Its LED segment will be supported by rising demand for high-resolution billboards in shopping malls, he adds. 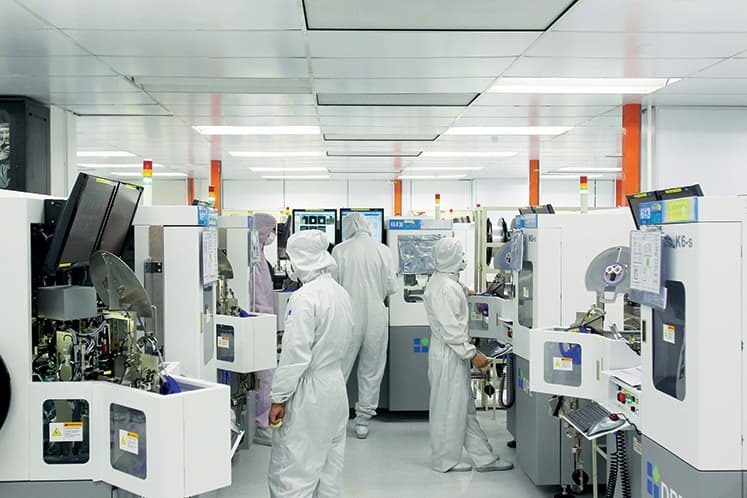 Affin Hwang Capital analyst Kevin Low says the group’s radio frequency is going through a rough patch but expects stronger quarters ahead, noting the expected contribution from Osram, which is likely to come in by the second half of FY2019. “In our view, the pullback of the share price provides a good opportunity to take a position in one of the best plays in the global radio frequency testing space. “We strongly believe Inari will be a key beneficiary in the 5G transition as demand will be spurred by a multiple-fold increase in radio frequency components in these new devices,” he says.